Mr. Evans is the CEO, Evans and Associates Company of Arkansas, LLC. He has served as Special Consultant for Systems Design for the Department of Workforce Education/ Arkansas Rehabilitation Services. Evans is also is the former director of Disability Determination for the Social Security Administration for Arkansas. He has received many awards for his community service; including the Disability Leadership Award from the Social Security Administration, National Johanna Cooke-Plaut Community Leadership Award by Easter Seals, one of two in the nation; Arkansas Medical, Dental and Pharmaceutical Association Community Service Award and the University of Arkansas for Medical Sciences, College of Medicine, Minority Affairs Support Award, as well as, United States Postal Service Community Service Award. 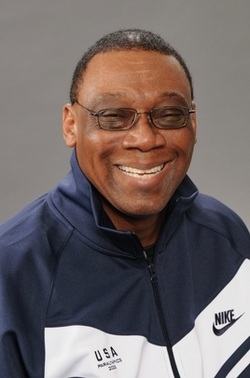 Grover has been inducted into the Arkansas Black Hall of Fame, the Arkansas Swimming Hall of Fame and bio and photo is featured at the International Swimming Hall of Fame. He is an author and has published numerous articles on Wellness, Goal Setting; Believing in Yourself; Being the Best and other topics. Currently, he serves on the State’s Public Health Performance Standards Assessment Committee, Olmstead Steering Committee, Arkansas Substance Abuse Committee, Arkansas’ Supported Housing Board, Arkansas Alzheimer’s Board, GIST Committee and TEFRA Committee. He also serves on the City of Little Rock Workforce Investment Board, and executive committee, Vice-Chair of the City Of Little Rock Community Housing Advisory Board, Central Arkansas United Way Board, State Chairman for Government Agencies for United Way, and the Advisory Council for Education of Children with Disabilities. He is a member of Our Lady of Good Council Parish, 4th Degree in the Knights of Columbus, Little Rock Christian Men’s Club, American Dietitian Association, and Arkansas chapter. He and his wife, Helen, have two children and a granddaughter.